in cooperation with Frau Pof. Dr. Gorbushina, Professor (FU Berlin) and BAM Federal Institute for Materials Research and Testing (BAM) in Berlin. 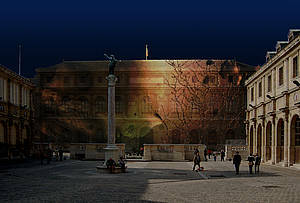 After the successful implementation of the UNESCO cultural project BOOTSCHAFT- LIFE FLAG „News from Everywhere“ in more than 80 embassies has led to new challenges: On November 27 th, 2011 the BOOTSCHAFT‘s new project, a media performance, CRYSTAL MIRROR will open the 17. ICOMOS General Meeting in Paris at the École nationale supérieure des Beaux-Arts (ENSBA) de Paris. under a video microscope inside the sculpture. The sample was given to Alexander von Humboldt in Paris, 1823 and has already been the focus of attention in the project LIFE FLAG. The microscopic images are visualized and communicated via digital networks. The message of the ever-changing microcosm represents the view of life in its essence and its universal context. Messages are communicated globally via the local site in the ENSBA, Paris. 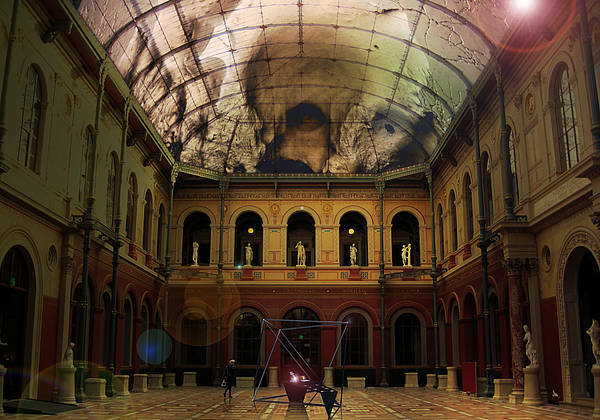 In addition to the live broadcast of the bacteria images on the internet, a virtual tour through Paris will take place in order to follow the traces of history/historic traces. These complex relationships can be visualized and brought into connection by using artistically designed apps as well as geo-location services. The, revival‘ of an almost 200-year-old bacterium which has been a product of trans-disciplinary collaboration demonstrates this multi-facetted symbolism. After the opening in Paris, the CRYSTAL MIRROR will go on its journey: From Egypt to Ecuador, Cuba, Germany, Russia and USA. It will enhance the dialogue between culture, science and politics, which is the main focus of my work. During the journey the, crystal ‘will develop into a living body of light. On its surface, the images of the bacteria will present and communicate their messages. The media performance BOOTSCHAFT-CRYSTAL MIRROR will open the 17. ICOMOS General Meeting which is under the patronage of the President of the French Republic, Nicolas Sarkozy and the UNESCO General Director, Irina Bokova.